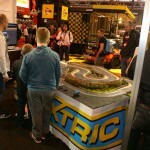 The Autosport International show was recently held at the Birmingham NEC and no less than three Scalextric tracks could be found in the show. Firstly Team Scalextric helping to promote Motorsport magazine had Adrian Holmes fullsize Scalextric sponsored mini on display with a unique track, which wound its way through the car across the dashboard. On top of the car was a display of all the Scalextric minis over the past 40 years. The fastest five laps of the day won a prize. 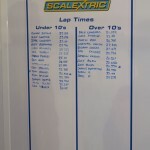 None other than David Brahbam dominated the leader board during the start of the show! 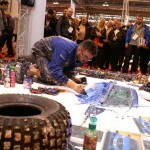 Further along in the main hall unique artist Ian Cook known as Popbangcolour was adding a colourful display of his artwork to the show along with a track setup where passers by could try and win a print of one of Ian’s artworks. 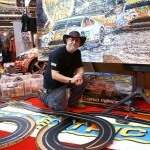 Ian’s Father has also custom painted a Bugatti Scalextric car which will will show you in another news post. 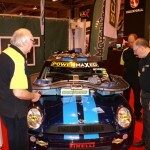 Finally Mini challenge representing the race series, of which Adrian Holmes car takes part in, had their very own stand running a competition to win a Scalextric set. 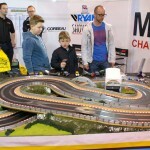 This race track was just across from the BTCC touring car display so attracted a vast amount of youngsters to try their hand with a slot car. 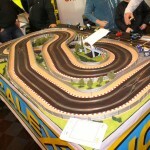 It was great to see Slot racing at such a high profile show, lets hope more and more companies adopt this form of attraction for future events.